The first and most important step to controlling your cockroach problem is properly identifying what kind cockroach you have. Believe it or not, you can not treat all cockroaches the same. The easiest way to distinguish them is their size. 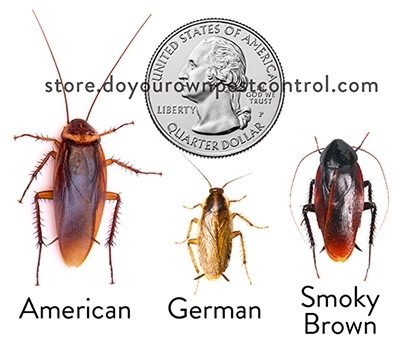 Choosing a roach control product is easier when you know what type of roach you have. We carry Aerosols, Insecticides, Dust/Dusters, Gels, Granulars, Baits , Traps , Insect Growth Regulators (IGR's), German Roach Kits. 1. Are they smaller(1/2"), golden brown, with 2 dark distinctive stripes behind the head? For German Roach control in restaurants, use a combination of Orthene PCO and Tekko IGR and a flushing aersol like CB 80. It is very difficult to use a roach bait in restaurants. 2. Are your roaches bigger (1"-1.5" ) long, with wings? Many people call these bigger roaches ,"Palmetto bugs". The larger roaches include the American, Smoky Brown, Oriental, Australian and the Wood Roach. The most common large roach in the USA is the American Roach. These larger roaches inhabit cool and damp locations, such as mulch, leaves, and wood piles and organic debris. They may be found in attics, basements, sewers, and landscape timbers. These larger roaches do not inhabit inside living quarters like the German Roach. They simply wander inside the building looking for water. Use a residual insecticide such as LambdaStar Ultracap 9., D-Fense SC, or Cyper WSP as a perimeter spray around your home. Spray about 3 feet up the side of the structure and 3 feet out from the structure. The LambdaStar Ultracap 9.7 adheres well to surfaces and will stay active longer due to its encapsulated technology. You may spray inside with the products for extra protection. Spray under the sinks, behind the refrigerator, dishwashers, freezers, washers. Spray inside the garage and along door thresholds.